Kraft: Grand Duo Concertante for Violin and Cello in D Minor, Op. 3, No. 1 (1811). Facsimile of ca. 1811 edition (parts only) and modern performing edition, score and parts. Antoine (Anton) Kraft (1749-1820) was a cellist in Haydn’s Esterhazy orchestra from 1778-90 and Beethoven wrote his Triple Concerto for Kraft. 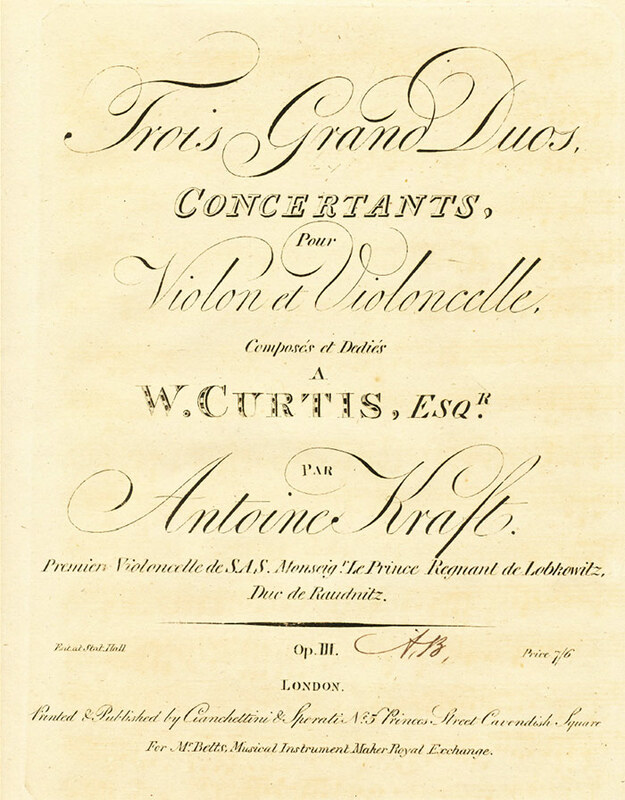 The 3 Grand Duos, Opus 3 were probably first published in 1792. The first movement of No. 1 in D Minor is in sonata form with slow introduction, and the three-part second movement is a Cantabile Adagio, a Recitative for the violin, and a Rondo closing. I found a YouTube video of the first movement Kraft Grand Duo No. 1 but not from my edition. Note that they are playing from the facsimile, not my edition.